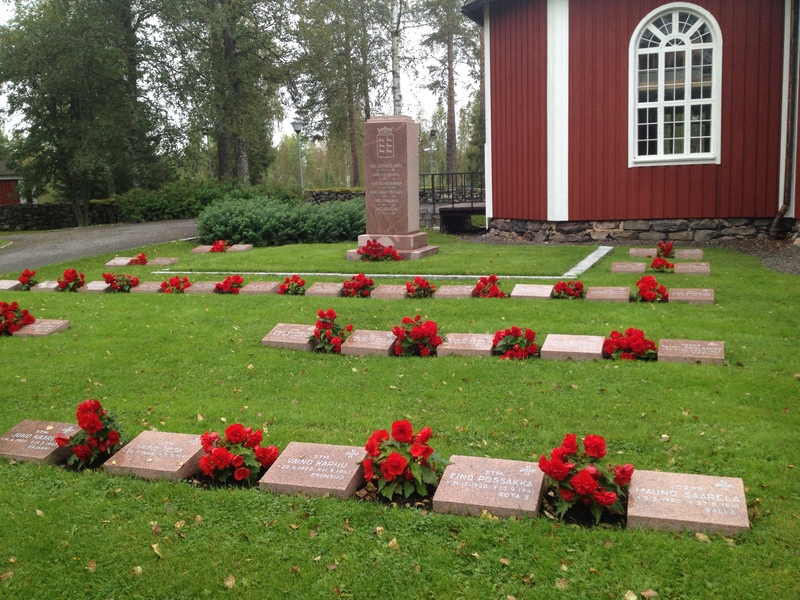 Soldiers’ graves at the Kiiminki Church in northern Finland. One of Finland’s best-preserved wooden churches today sits outside Oulu, where the Kiiminki Church was completed in 1760. The modest cruciform frame church in northern Finland was designed by church architect Matti Honka and is noted for its spectacularly well-preserved altar painted by Mikael Toppelius in the 1780s. Like scores of other Finnish community church yards, the Kiiminki church is surrounded by a cemetery that includes the remains of local soldiers who fell during World War II. Often referred to as “heroes’ cemeteries” or “hero graves,” these resting places are staples of the Finnish countryside testifying to the Finns’ concrete World War II losses—and at least implicitly underscoring the nation’s defense against global super powers. In the midst of the Kiiminki cemetery a stream of visitors moves across the site in a very distinctive motion familiar everywhere in the world with wireless coverage. In small groups shuffling forward, trading counsel, and studying their cell phone screens, Pokémon Go players hunt down virtual creatures in real-world surroundings including Kiiminki’s church and cemetery. The augmented reality mode of Pokémon Go transforms prosaic spaces—neighborhoods, religious spaces, historic sites–into newly engaged landscapes populated by multi-colored creatures, Poké Stops to fortify your avatar’s supplies, and Poké Gyms to train and bond with other players. 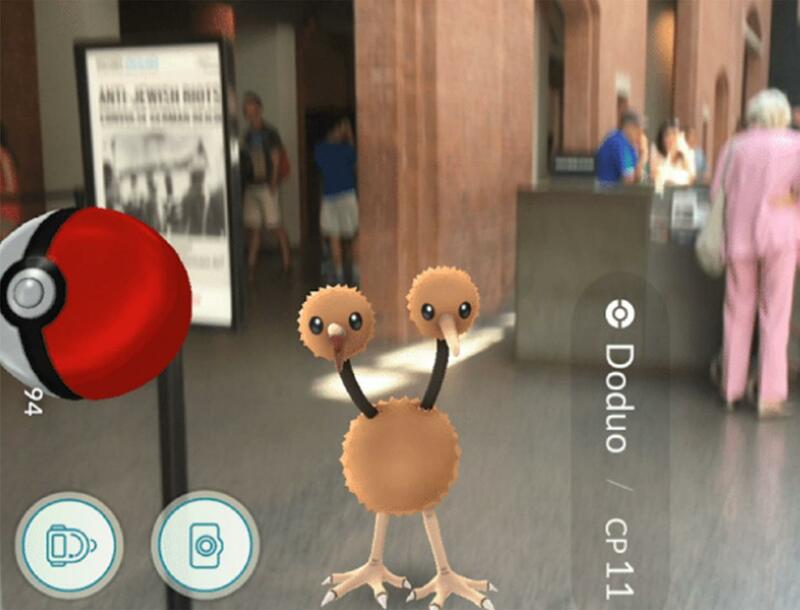 This DoDuo was captured at the Holocaust Memorial Museum in Washington, D.C., which has subsequently asked the game be excluded from the site. The trickle of Pokémon Go players in Kiiminki, Finland can be found in an astounding number of places throughout much of the world. Alongside the Crown Jewels, for instance, the Tower of London harbors a host of rare Pokémon including Koffing, Tentacool, Hitmonlee, Sandshrew, Polywhirl, and Dragonite; Times Square has a massive Poké Gym; and legions of Pokémon hide in the gardens in Tokyo’s Meiji Shrine, an early 20th-century Shinto shrine to Emperor Meiji and his wife, Empress Shōken. While the number of active players has decreased since the game’s release in July, there were still about 30 million active players at the end of August and roughly 5000 downloads of the game every minute on September 1st. In July the National Park Service reported a dramatic upsurge in attendance it linked to Pokémon Go play; the New York Times’ Amy Butcher celebrated the game’s capacity to illuminate local landscapes that melt into ignored everyday life; and some churches have applauded the game’s ability to draw visitors to houses of worship. 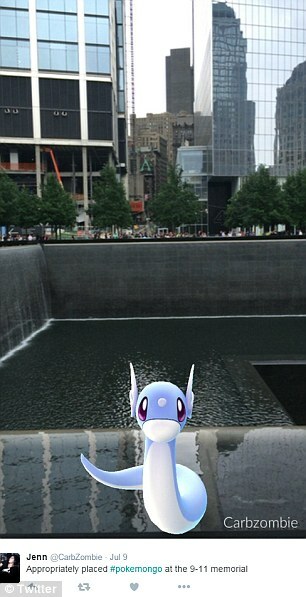 A Pokeon Go screenshot at the National September 11 Memorial. 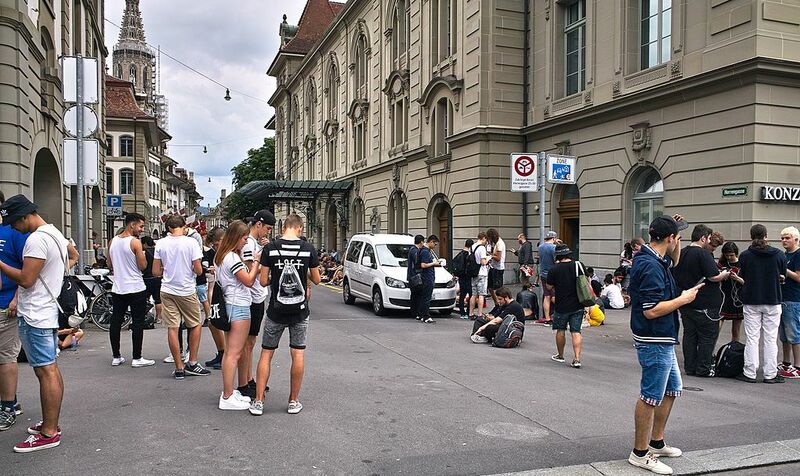 The places where Pokémon Go can be found include many heritage landscapes, and some observers decry Pokémon Go play in sacrosanct places violated by a Pokémon hunt. In July, for instance, both the Holocaust Memorial Museum in Washington DC and Auschwitz asked that they be removed from game maps because they were sacred sites (a year ago Pokémon Go maker Niantic Labs also drew criticism for including Holocaust sites in its augmented reality game Ingress). 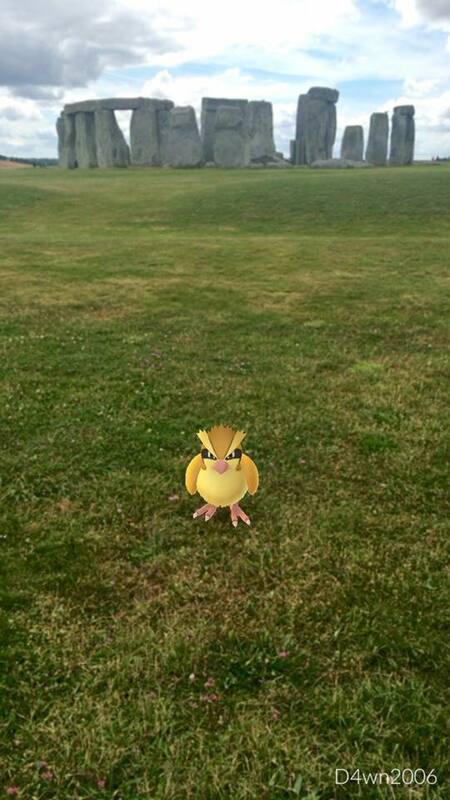 Similar resistance to Pokémon Go play has been voiced at heritage sites including the National September 11 Memorial in New York City, the Hiroshima Peace Memorial Park, the Tuol Sleng Genocide Museum in Cambodia, and Arlington National Cemetery, but even less traditional heritage spaces have banned Pokémon Go in environmental preserves, small French villages, and local cemeteries (though some communities see the game as a mechanism to transform cemeteries into broadly used public space). Heritage sites perpetually wrestle with a host of practices that seem to violate mostly ambiguous implied codes of respect even as they struggle to narrate meaningful historical narratives. Conventionally heritage landscapes preserve history’s stages (e.g., battlefields) or provide contemplative spaces (e.g., museums) that invoke the power of place in service to heritage narratives. Particular places become cast as sanctified through their definition as commemorative spaces acknowledging tragedy and loss, and while few observers would defend Pokémon Go in Auschwitz the exclusion of the game from a host of house museums, public spaces, and historic sites is somewhat more problematic. The anxiety prompted by Pokémon Go may be that it ignores the veneer of heritage and imagines place in enormously broad, digitally mediated terms. Defenders of heritage sites may worry that visitors to attractions like the Tower of London are simply chasing Pokémon and ignoring the heritage itself, but they may also implicitly worry that those heritage narratives are boring if not outright irrelevant to many people. 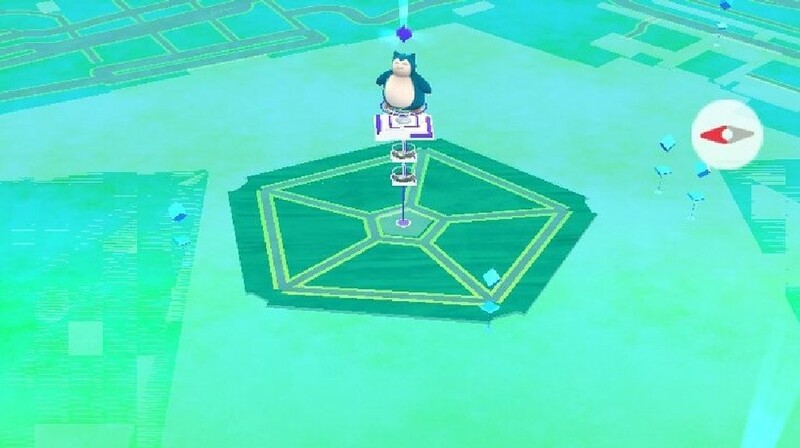 A Pokemon gym is purported to be located in the Pentagon itself. A Spot Message screenshot of dead family members playing back messages at their burial site. 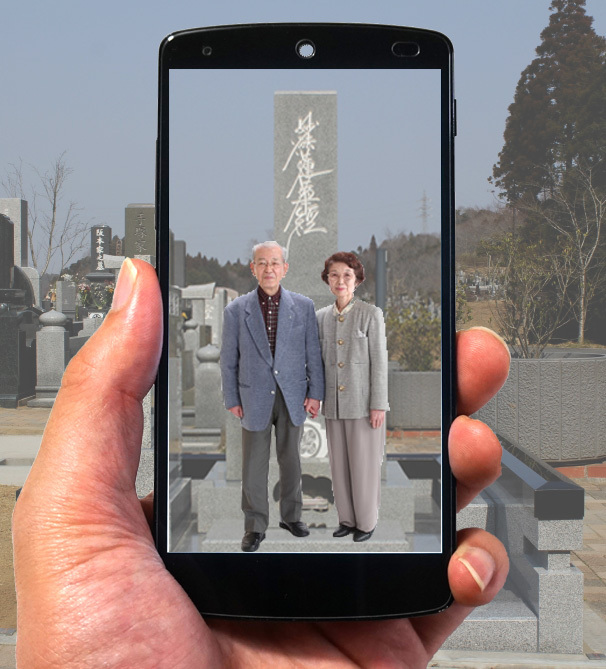 The phone app Spot Message uses an augmented reality system much like Pokémon Go to visit cemeteries and receive messages from the dearly departed. The app’s developer Yoshiyuki Katori indicated that the sudden death of an uncle “shattered the lives of his family. I also respected him a lot, so I would often visit his grave, consulting with him in my mind whenever I had issues concerning my business. I wondered how comforting it would be if he could talk to me at his grave, with messages like ‘How are you doing?’ and ‘Hang in there.’” Most media attention has focused on the app’s potential to record videos to be shown in cemeteries after death, but the technology could of course be used to document any place-based event, and augmented reality heritage apps have been examined and developed over more than 15 years (e.g., compare the 2001 ARCHEOGUIDE: first results of an augmented reality, mobile computing system in cultural heritage sites; more recently, examples include the European Research Consortium for Informatics and Mathematics’ 2015 newsletter on augmented reality applications). Augmented reality apps certainly could transform place-based heritage narratives by placing them in the hands of disparate storytellers likely to narrate prosaic and perhaps even idiosyncratic histories that break from grand interpretations. It is probably reasonable that some heritage landscapes remain outside augmented reality gaming, but it is difficult in many cases to distinguish between landscapes where heritage should be somehow sacrosanct and where it is open to a reasonable variety of experiences. 2010 Developing serious games for cultural heritage: a state-of-the-art review. Virtual reality 14(1): 255-275. 2012 Personalization in cultural heritage: the road travelled and the one ahead. User modeling and user-adapted interaction 22 (1-2): 73-99. 2012 Meaningless Death or Regenerating Sacrifice? Violence and Social Cohesion in Wartime Finland. In Finland in World War II: History, Memory, Interpretations, pp. 233-275, eds. Tiina Kinnunen & Ville Kivimäki. Brill, Leiden. 2000 ‘This is where they fought’: Finnish war landscapes as a national heritage. In The politics of war memory and commemoration, edited by T.G. Ashplant, Graham Dawson, and Michael Roper, pp 145-164. Routledge, New York. 2004 Karelia lost or won–materialization of a landscape of contested and commemorated memory. Fennia, International Journal of Geography 182(1): 61-72. 2001 ARCHEOGUIDE: First results of an Augmented Reality, Mobile Computing System in Cultural Heritage Sites. In Virtual Reality, Archeology, and Cultural Heritage, pp. 131-140. 2004 Building virtual and augmented reality museum exhibitions. In Proceedings of the ninth international conference on 3D Web technology, pp. 135-144. ACM. Posted on September 1, 2016, in Uncategorized and tagged heritage, Pokémon Go. Bookmark the permalink. 3 Comments.